There are some diseases which disproportionately affect certain racial groups. For example, diabetes and hypertension are especially prevalent in the African-American communities. And amyotrophic lateral sclerosis (ALS), also called Lou Gehrig’s disease, appears to be most common among Caucasians - especially males. According to the ALS CARE Database, 60% of the people with ALS in the Database are men and 93% of patients are Caucasian. ALS is a rare but devastating disease and reportedly affects about 3.9 people per 100,000 in the U.S. population. It is a progressive neurodegenerative disease that affects nerve cells in the brain and spinal cord. Essentially, this disease causes you to lose control of your brain. And if you don’t have control of your brain, you don’t have control of your body. ALS also causes loss of muscle control. The leading cause of death from ALS is respiratory failure. Former New Orleans Saint NFL player Steve Gleason is currently battling ALS. Reportedly, he was diagnosed at just 34-years-old (ALS is more commonly found in people between the ages of 55 and 75). There is no cure or known cause of ALS, however, some sources say repeated head trauma from playing football could be the possible culprit behind Gleason developing ALS. “There are several other young football players who have suffered from ALS, such as Tim Shawand Kevin Turner, who died of the disease in March  at 46,” according to one source. Another case of ALS we previously discussed involved Pulitzer Prize-winning playwright and Oscar-nominated actor Sam Shepard, who died of ALS at the age of 73. And then there was the incredible story of Stephen Hawking and his battle with ALS that lasted around five decades! Hawking, who died last March at the age of 76 due to ALS, was diagnosed with the disease at just 21-years-old. After being diagnosed, doctors told him he would only live two years. Hawking proved them wrong by living another 55 years and achieving incredible things in his career as a physicist. These stories of ALS all involve Caucasian men. At the end of the day, irrespective of our backgrounds, anyone may become a victim of this devastating disease. But the good news is that we can learn as much as we can about this disease and identify ways to be proactive. One of the best preventative strategies may be following a healthy, nutrient-rich diet that fights oxidative stress and inflammation. But in addition to this, recent research shows that high doses of vitamin B12 supplementation may be able to slow down the progression of ALS if you already have it. The key is that you start supplementation before or during early onset (within the first year) of having ALS symptoms. 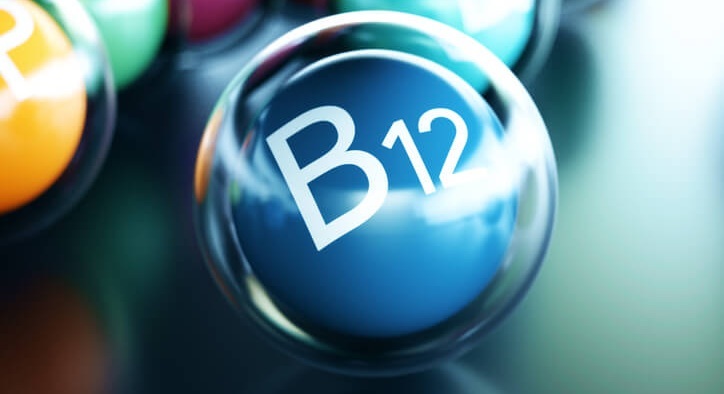 The research involved treating people with ultra-high-dose methylcobalamin, the physiologically active form of vitamin B12, according to one report discussing the study. (Main sources of vitamin B12 are found in animal products, like meat and eggs. So if you are vegetarian or vegan, you may need to incorporate a B12 supplement into your diet). According to the report, methylcobalamin is a form of B12 that can be used as a dietary supplement to treat megaloblastic anemia. One body of research suggests that methylcobalamin was able to decrease homocysteine levels. “Homocysteine (Hcy) exerts multiple neurotoxic mechanisms that have also been shown to be relevant in the pathogenesis of amyotrophic lateral sclerosis (ALS),” reports the National Institutes of Health (NIH). Another study showed that ALS patients who received ultra-high-doses of B12 injections directly into their muscles showed improvement in muscle electrical activity only after just two weeks. One study in Japan conducted with ALS patients showed that administering ultra-high-dose methylcobalamin therapy may improve the prognosis of patients. But, again, this appeared to only be evident in patients who started this therapy during early onset of symptoms. This does not mean that you should be trying to get as much B12 into your body as possible in order to prevent or better manage ALS. If supplementation, especially when it’s used to treat a serious disease, is not administered by a competent healthcare professional, you may not end up receiving the benefits. On top of this, when you supplement, you have to consider all of the other nutrients your body needs. And overdoing it on one nutrient may ‘knockout’ other essential nutrients that help keep you healthy. So you need to be mindful of all supplements you may be taking. For example, taking potassium supplements may deplete B12 from the body. Furthermore, vitamin C supplements may affect the ability of your body being able to efficiently absorb B12 from foods. Vitamin C supplements may break down vitamin B12 in the digestive tract and increase the absorption of iron in the gastrointestinal tract. These are all reasons why routine nutrient tests are highly recommended. And remember to seek medical advice from a competent healthcare professional before you supplement, especially if you are battling a disease like ALS. B12 Cure-All or Waste of Money? Are B12 injections worth the hype? Animal sources like meat and eggs are the primary sources of B12 in the U.S. A simple blood test can tell you your level — numbers between 500 and 1,000 pg/ml are desirable. However, vegans, vegetarians, women, alcoholics, people with bowel diseases like colitis or Crohn’s, and people who have had gut surgery (like gastric bypass surgery) are the most likely to be deficient. Additionally, absorption of food-bound vitamin B12 decreases as we age. It is generally recommended that adults 51 years and older take a supplement containing vitamin B12. B12 is a water-soluble vitamin, which means that it dissolves in water. In general, after the body uses water-soluble vitamins, leftover amounts leave the body through the urine. B12 is different in that it can be stored for years in the liver. It is actually the only water-soluble vitamin that can be stored in the body. What are the risks of B12 deficiency? The risks of B12 deficiency include anemia, numbness, impaired senses and nerve damage. If you do have a deficiency, evidence shows that a simple oral tablet is just as effective in restoring levels as injected B12. A 2011 study in the journal Clinical Therapeutics showed that people were able to attain 100% of desired B12 levels simply by taking a daily oral supplement. What about taking supplements even when you don’t have a deficiency? It seems to depend on what you want to take it for. In 1978, researchers in the British Journal of Nutrition measured exercise performance before and after B12 injections (or placebo injections) and found no difference in performance. But another study looked at young people with hearing loss due to too much noise exposure. This study found some benefit in hearing in the participants who took extra B12. This makes some sense, since B12 is critical to nerve health. The B12 you don’t need will be excreted in the urine, unless you have liver disease. There is a small subset of people who truly cannot absorb vitamin B12 well from food or from oral supplements. There is a test called CobaSorb that will tell you if you are one of them. Potassium supplements can reduce absorption of vitamin B12. There is also some evidence that vitamin C in supplements can interfere with obtaining the vitamin B12 found in foods. But note that if you’ve had weight loss surgery, your doctor should guide you in deciding what supplements should be taken. Although taking vitamin B12 has almost no side effects, your dollars should be spent on supplements you actually need. If you have low B12, opt for a less expensive pill form; if your B12 level is normal, take a multivitamin to boost all your vitamin levels. Who may be at risk for B12 deficiency? Do you have pernicious anemia? Are you on long-term antibiotics? Do you gave gastritis? Are you a smoker or a vegetarian or vegan? Do you drink a lot of alcohol? If you answered yes to any of these, you may be at risk for vitamin B12 deficiency and should consider a supplement. How much B12 can I take? If your kidneys and liver are healthy, you can probably take 1,000 micrograms daily without adverse effects (which may include itching, numbness and tingling, rapid heartbeat, diarrhea and swelling). Some doctors say there are absolutely no side effects to massive B12 doses. However, the recommended daily intake of B12 is less than 3 micrograms. Taking over 3,000 micrograms, which is significantly higher than the recommended daily intake, is known to cause adverse effects. At pH Labs, we help you find out what your body really needs through a personalized health assessment, advanced lab testing and can assist you with boosting b12 through our pH Drip Lab. This way, you’re not left to trial and error to find out what supplements to take or lifestyle adjustments to make. Our doctors will work with you to address any deficiencies in your body, including vitamin B12. Visit our website or call us at 855-PHLABS1 to schedule an appointment.